What’s one of the best ways to keep visitors to your site engaged with you and coming back for more? An e-newsletter, of course! And the best way to get people to subscribe is with the Squarespace Newsletter Block. Often placed in the footer or sidebar of your Squarespace site, the Newsletter Block is a form that collects new subscriber info. You’ll have to select a storage option for these submissions—either MailChimp or Google Docs, or both. If you require further customization to your newsletter block, that’s not a problem. You can either opt for the Squarespace Form Block or check with us for other options. We can generally offer a customized solution for your special circumstance. Begin by adding a Newsletter Block to the content area of your Squarespace site. Once added, simply configure as needed, then reposition within the content area as you would with any other block. Below is an example Newsletter Block. You can style it within the Style Editor in your Squarespace tools and choose from various visual settings. Within the Newsletter Block there are three different tabs to choose from when configuring. 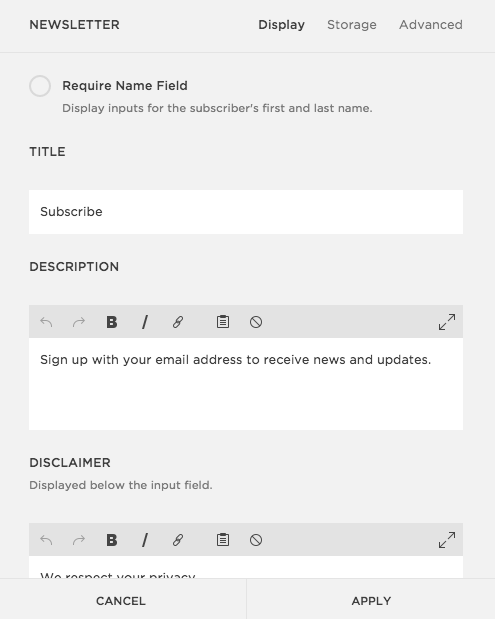 In the Display Options tab, you can elect to require a name field, insert a newsletter title and description, and add any needed disclaimers. In the Storage Options tab, you can select whether to connect new subscriber information to Google Docs, MailChimp, or both. In the Advanced Options tab, you can label the submit button, craft the message that displays after users submit the form, and, if you know a little HTML, can even create more advanced post-submit message responses.